Watch Democracy Now! 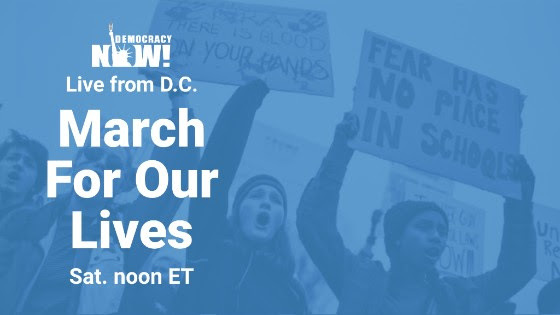 's LIVE coverage of the March For Our Lives in Washington, D.C.
Amy Goodman and the Democracy Now! team will broadcast live coverage of the March For Our Lives in Washington, D.C. This historic event was created and inspired and is led by students. We’ll feature voices of students and people of all ages who plan to converge on the capital and over 800 other cities around the world to demand action on gun control. Watch LIVE Saturday starting at noon ET at democracynow.org. Check your local Democracy Now! station for listings.